At Texas Veterans for Veterans, we accept veterans from all branches of the service who have received an honorable discharge. To become a member: complete the membership form, return it to the TVFV office and attend a meeting. Upon receipt of your application, it will be reviewed and upon acceptance, you will be invited to a business meeting and will be sworn in (pledge below). 1st, 2nd, 3rd Tuesday are Coffee & Donut meetings, for socializing and support. 4th Tuesday of the month is a Business meeting open to all members. New members are sworn in at business meeting. Click on the link above, print and complete this document. Mail completed form to the address listed above, or bring to a regular meeting. 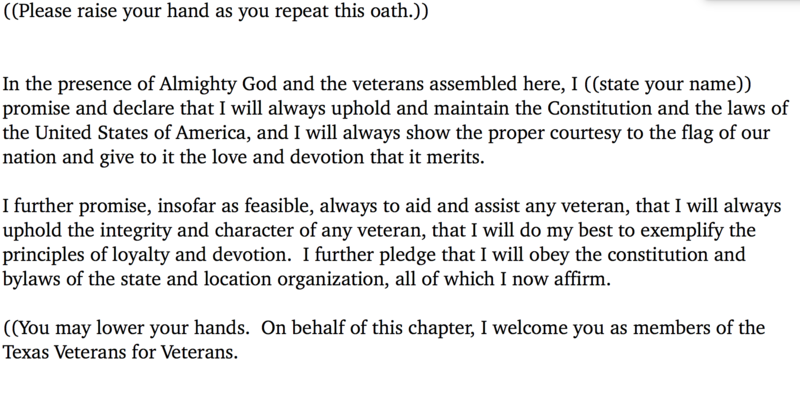 Click on the link above to read the pledge that you will be required to swear to as part of your membership joining process. Copyright © 2017 | Texas Veterans for Veterans | All Rights Reserved.